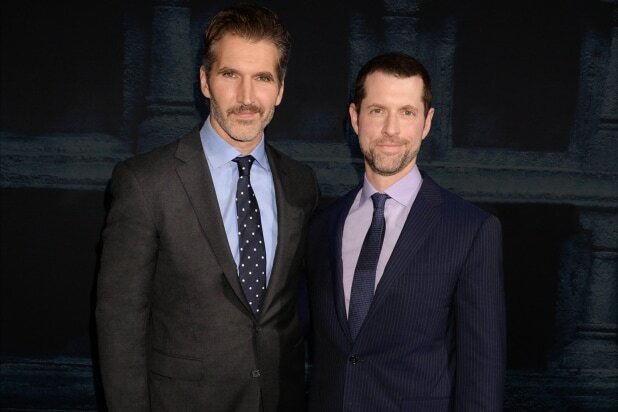 “Game of Thrones” showrunners David Benioff and D.B. Weiss will receive the Founders Award at this year’s International Emmy Awards in November. The Founders Award is given annually to those whose “creative accomplishments have contributed in some way to the quality of global television production.” The HBO fantasy epic has almost exclusively filmed aboard in locations Northern Ireland (mostly in Belfast), Croatia, Iceland and Morocco. The series airs in over 207 countries. “The International Academy does us all a great honor. From cast to crew to locations, the ‘Game of Thrones’ effort was truly international, and this award rightly belongs to all the people who worked so hard for so many years to bring the show to life,” Benioff and Weiss said in a statement Monday. The International Emmy Awards will be held Monday, Nov. 25, in New York City. “Game of Thrones” is heading into its eighth and final season, which will premiere April 14. The series finale is slated for May 19.